On April 28, the New York State Psychological Association’s Organizational, Consulting, and Work Psychology Division is hosting a conference on workplace bullying at John Jay College of the City University of New York in Manhattan. Gary Namie and I are the keynote speakers, joined by an impressive cadre of presenters and moderators. I’ve pasted in the agenda, speakers, and registration info below. Although I imagine that most of the attendees will be organizational psychologists and consultants, the conference is open to the public, with sliding fees based on affiliations, student status, etc. The registration link is here. As a side note, this helps to explain why I haven’t been posting as frequently lately. In addition to hitting a busy point in the semester, I’ve got a heavy schedule of speaking commitments that takes me through July. Most of these appearances require the preparation of materials to share with fellow participants and attendees, which is keeping me on an ongoing cycle of writing, cutting, and pasting! It’s all good, though — a sign that these important workplace issues are getting a hearing. This conference brings together two Keynote National Experts on workplace bullying (WB) and a broad range of leaders and advocates in the psychology, conflict resolution, law, and business communities. I/O psychologists, private practice psychologists working with individuals experiencing WB related anxiety, depression, and/or PTSD symptoms, forensic psychologists doing WB assessment/evaluation and consulting, conflict resolution professionals, and managers and human resources professionals dealing with organizational stress and change will find ways to enhance their understanding and skills. Ruth Namie, PhD, of “The Bully-Free Workplace” and “The Bully At Work”. He has taught management and psychology courses at the university level for more than 21 years and directs the only U.S. research and education organization dedicated to workplace bullying. Professor of Law at Suffolk Law School in Boston, he is considered the leading legal authority on workplace bullying. The Healthy Workplace bill has been introduced in a number of states, including New York. Its impact on employers and employees, when passed, will be discussed. CE credits (pending, but expected) and opportunity for Free OCW Membership. Registration includes morning coffee/muffins and a light sandwich buffet lunch. I sometimes field variations of this question concerning workplace bullying: Aren’t we talking about people who can’t deal with a tough boss? My typical response is that there’s a big difference between a tough boss and an abusive one. Grynbaum and Chen don’t stop with generalizations; they add plenty of specific examples, as well as Quinn’s own characterization of her persona. The full piece is worth reading. Suffice it to say that the article describes a laundry list of classic bullying behaviors. While some workplace aggressors tend to be more direct or more indirect, Quinn apparently has mastered both forms. In terms of overt, direct behaviors, she’s a yeller and screamer, often employing foul, threatening language. In terms of covert, indirect behaviors, she brutally retaliates in response to even minor perceived slights. To be sure, politics can be a bloodsport, and those who seek to be players must have a thick skin if they want to survive. The article fairly points out that Quinn has been an effective Speaker in some ways and that previous holders of the office to which she aspires, including celebrated Mayors such as Fiorello LaGuardia and Rudy Giuliani, also had notable tempers. In addition, there always is the risk that women will be judged more harshly on such measures. And it’s possible, perhaps even likely, that some of the people who criticized Quinn but would not allow their names to be disclosed are among her political opponents and thus have their own agendas. Nevertheless, this article does not smack of a planted hatchet job on one candidacy. Rather, it describes a pattern of repeated, highly volatile, abusive behaviors. It clearly shows us the difference between hard-nosed, demanding leadership and workplace bullying. I’ve read and heard opposition to the adoption of laws that address bullying in work or school settings on the ground that such measures “demonize” those accused of engaging in bullying behaviors. I can’t speak for all current and proposed anti-bullying laws. However, as the author of the Healthy Workplace Bill, which serves as the primary template for workplace anti-bullying legislation across the country, I certainly can address whether that criticism fairly applies to this particular proposal. The Healthy Workplace Bill provides targets of severe workplace bullying a legal claim for damages and creates liability-reducing incentives for employers to take preventive and responsive measures toward this form of mistreatment. It allows claims to be brought against both employers and offending co-employees. Prevention is the most important public policy objective for any workplace bullying law. The HWB achieves this by significantly reducing liability exposure for employers that pro-actively prevent workplace bullying and respond promptly and fairly to claims of workplace bullying. The HWB doesn’t even mention the terms “bullying” or “bully” in its key language. Rather, it uses the term “abusive work environment” to define the conditions that lead to liability. The HWB allows for a full range of potential damages to be awarded to individuals who can prove their claims, including punitive damages for especially egregious behavior. So yes, it is possible that an individual aggressor could be found liable under the HWB. However, it is more likely that employers, rather than individual aggressors, would pay the bulk of those damages. Put simply, most plaintiffs employment lawyers know that unless liability can be imposed upon the employer, the likelihood of recovering damages is slim. In my earliest writings about this topic, I suggested that punishment should be among the public policy goals of any workplace bullying law. I’ve softened on that point since then. I fully understand the emotions that cause some targets of workplace bullying to desire retribution. And while I do believe that compensation is a just goal for the Healthy Workplace Bill, the objectives of revenge and punishment seem less appropriate to fuel legislation designed, ultimately, to affirm human dignity. That said, holding someone accountable for engaging in proven, targeted, health-harming interpersonal abuse is not “demonization.” We must be careful not to overuse the term, lest we become resistant toward all notions of personal responsibility for severe, intentional mistreatment of another. Yesterday served as a welcomed reminder that healthy dialogue can play an important role toward advancing the interests of workers and workplaces. I was fortunate to participate in two excellent events, and I’d like to share a bit about each. 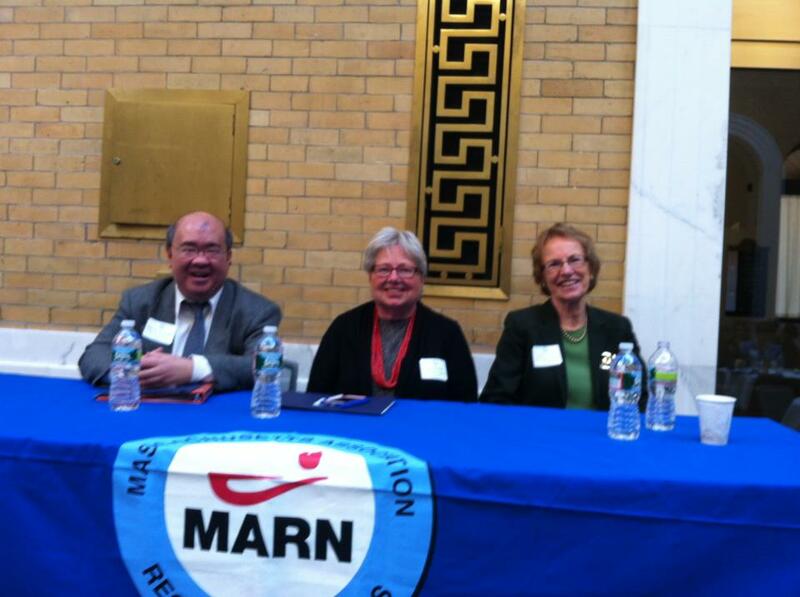 I spent the morning at the Massachusetts Association of Registered Nurses 2013 Health Policy Legislative Forum, held in the Great Hall of the State House. There I joined Representatives Ellen Story (a lead sponsor of the HWB, House Bill No. 1766) and Kay Khan (a HWB co-sponsor and psychiatric nurse) for presentations and Q&A about workplace bullying in healthcare and the importance of supporting anti-bullying legislation. MARN is one of the organizational endorsers of the HWB. The discussion was both practical and policy oriented. We talked about the challenges of dealing with bullying behaviors in the healthcare workplace, as well as the role that associations like MARN can play in advancing the Healthy Workplace Bill. It’s an honor to present with two elected officials who truly “get it” when it comes to how public policy can promote human dignity in the workplace. The three of us were pleased to be there, as the photo above (grabbed shamelessly from Rep. Story’s Facebook page) indicates! For the afternoon, I hopped on the subway to a conference sponsored by the Northeastern University Law Journal, Employed or Just Working? Rethinking Employment Relationships in the Global Economy, which focused on the changing definitions of employee status and their impact on workers and organizations. Several panels focused on the common practice of employers misclassifying workers as independent contractors that, in turn, allow them to avoid paying wages, overtime, and benefits. Some of these practices are egregious, as lawyers who litigate these claims explained to us. We also heard from attorneys representing employers, and they provided an important perspective on the challenges of engaging in good-faith compliance efforts with laws that define “employee” in significantly different ways. A compelling panel featured advocates and scholars who are examining the difficulties confronting domestic workers such as home health care attendants who are trying to obtain decent wages and benefits. These issues aren’t going away as our population ages and the demand for affordable in-home care increases. Thank you to both MARN and Northeastern for these opportunities to share information and ideas and to engage in discussions with people who care about the quality of our work lives, and congratulations for putting on very successful events involving multiple speakers. I hope that others who attended and participated benefited as much as I did. 1. Non-profits: If you need a committee to obsess over your mission statement, you may not have a real mission (July 2012) — Any decent non-profit organization should know its mission without convening a committee to define it! 2. One-way feedback: In-house employee surveys and the illusion of open decision making (July 2012) — Here’s the giveaway: YOU fill out the survey, THEY keep the raw results to themselves. 3. When survival is at stake, we need grounded leaders (July 2012) — This is especially the case when non-profits are facing limited resources and tight budgets. 4. Burnout in the non-profit sector (February 2012) — A frequent occupational hazard. 5. “Should I stay or should I go?” Career insights from Seth Godin and The Clash (September 2011) — A dilemma for those devoted to their work but suffering in their organizations. 6. When the bullying comes from a board member (August 2011) — This is a neglected topic that cries out for more research. 7. “Strategic planning”: All too often, a time-sucking bridge to nowhere (July 2011) — How many gazillions of hours have non-profits thrown away on strategic plans that are either hopelessly vague or after-the-fact validations of decisions already made? 8. How’s this for an epitaph? “She lived a balanced life” (June 2011) — Some work-life balance thoughts, a frequent issue for those dedicated to their causes. 9. Workplace bullying in the non-profit sector (January 2011) — If you’ve been around non-profits long enough, you know that bullying behaviors aren’t limited to the big bad corporations! 10. Is your workplace psychologically and ethically healthy? (July 2010) — Surprisingly (perhaps), these questions sometimes are overlooked in non-profit work settings. The human costs of our ongoing economic crisis continue to mount. If your primary impressions of the economy are shaped by the rise in the Dow Jones Average, you might be wondering what I’m talking about. But for countless millions of others who are more concerned with the challenges of paying their bills, feeding their kids, saving for the future, and finding work, crisis remains an apt way to describe this economy. Last week my cousin died of a heart attack. After working continuously for the first two-thirds of his career, recently he’d bounced from short term jobs to stretches of unemployment. This cycle is tough enough on someone just starting out a career, but for someone in their early 60’s, it can literally be a heartbreaker. Read what he has to say about maintaining hope through the 4 “Ps”: perspective, pride, pals, and possibilities. When the economy crashes, we all crash together: corporate profits, employment, and growth. But when the economy recovers, we don’t recover together. Corporations rack up historic profits thanks to strong global demand, cheap global labor, and low interest rates, while American workers muddle along, their significance to these companies greatly diminished by a worldwide market for goods and people. An often overlooked number calculated by the Labor Department shows millions of Americans want a job but haven’t searched for one in at least a year. They’ve simply given up hope.
. . . These hopelessly unemployed workers have just been jobless so long, they’ve fallen off the main government measures altogether.
. . . Five years ago, before the recession began, about 2.5 million people said they wanted a job but hadn’t searched for one in at least a year. Now, that number is around 3.25 million. While retirement has assumed myriad forms across the country, many economists and other experts on retirement see some common, increasingly worrisome trends. A growing number of workers are convinced they will not have a comfortable retirement. A Boston College study in October found that 53 percent of Americans were “at risk” of being unable to maintain their pre-retirement standard of living once they retire, up from 30 percent in 1989. A study last May by the Employee Benefit Research Institute found that 44 percent may not have enough money to meet their basic needs in retirement. The broader economic implications are troubling. Graduates struggling to dig out from a mountain of student debt also tend to put off getting married, buying homes, and having kids. And since a bigger chunk of their income will go towards servicing the mortgages or car loans they are able to obtain at higher rates, they’ll have less spending power when they do eventually buy big-ticket items like homes and cars. The problem, however, is that the recession raised the bar for success while leaving fewer haves and more have-nots. America as a whole may be just as wealthy as it used to be, but the wealth is being shared by a smaller slice of the population. And that rearrangement may end up being permanent. The pattern we’ve found in our research is quite extraordinarily clear. More unequal countries, the ones with the bigger income differences between rich and poor have much more violence, worse life expectancy, more mental illness, more obesity, more people in prison, and more teenage births. All these problems get worse with greater inequality, because it damages the social fabric of a society. In this election, each side debated issues that deeply worry me: the long malaise into which the economy seems to be settling, and the growing divide between the 1 percent and the rest — an inequality not only of outcomes but also of opportunity. To me, these problems are two sides of the same coin: with inequality at its highest level since before the Depression, a robust recovery will be difficult in the short term, and the American dream — a good life in exchange for hard work — is slowly dying. The policies that led us to this widening gap between the haves vs. the have-less and the have-nots have been at least 30 years in the making, with “trickle-down economics” being the policy mantra of the era. This concept held that if wealthy people could keep more of their money and businesses could be freed of regulatory safeguards, the benefits would trickle down to everyone else. The centerpiece of trickle-down theory was that tax cuts to the wealthy would give a jump start to America’s economic engine, an assumption rebutted in a non-partisan Congressional Research Service report discussed in this Huffington Post piece. If you’re interested in learning more, read some of these articles and start connecting the dots for yourself. We’re at a critical economic juncture in America, and the well-being of all but the most fortunate is at stake. I dug into the blog archives from 2011 to pull these posts addressing some of the contextual issues surrounding workplace bullying and our attempts to understand and respond to it. If you didn’t catch them the first time around, I hope you find them worthwhile now! 1. America’s bullying culture (March 2011) — A look at broader cultural forces that fuel bullying and abuse at work. 2. The experience of being bullied at work: Insights and silos (November 2011) — How personal experiences of being bullied at work shape and limit our understanding of this phenomenon. 3. How lousy organizations treat institutional history (September 2011) — This post was not about workplace bullying per se, but it helps to explain how organizations that enable such behaviors find it easy to overlook, ignore, and forget them. 4. When bad employers retain thuggish employment lawyers (July 2011) — I’ve recycled this post on other occasions, but I think it bears repeating that employers that enable and defend bullying behaviors have an uncanny knack for retaining employment lawyers of the same ilk. 5. The American academic response to workplace bullying: A grounded orientation (June 2011) — Much of the important research on workplace bullying is not coming from elite institutions operating in rarified settings; rather, it’s largely the product of people associated with state, regional, and distance learning universities, as well as organizations such as the Workplace Bullying Institute.